Background: Onychomycosis is a common nail pathology, which is a challenge to healthcare professionals. Antifungal drugs have been the chosen therapy for many years. Laser technologies have now been introduced as a treatment for onychomycosis, avoiding the disadvantages of systemic and topical treatments [2, 12, 17]. Objectives: The purpose of this study is to demonstrate the real efficacy of laser therapy. Materials and Methodology: The following study into the treatment of onychomycosis has been carried out by the IRCSS – The Orthopaedic Institue Galeazzi, based in Milan, Italy. 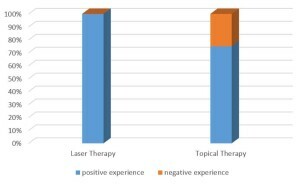 The study was conducted from January 2014 to September 2014 and compares and contrasts laser therapy with topical treatment therapy. The laser treatment was performed with a diode laser, operating at 1064nm from A.R.C. Laser GmbH. The infected nail was treated in 2 sessions with 7 days between treatment sessions. The topical treatment was performed with an antifungal nail polish, containing Niogermox 80mg/g, which was applied to the infected nail daily. As reference, a cultural study of the infected nail was taken where a positive fungus sample was found. After that, the patient was allocated into either the group where a topical or a laser therapy treatment would be performed. After a period of 5 months the results of the treatment could be compared, a visual-based index was created in order to compare the healing with both, clinical and mycological, factors considered. 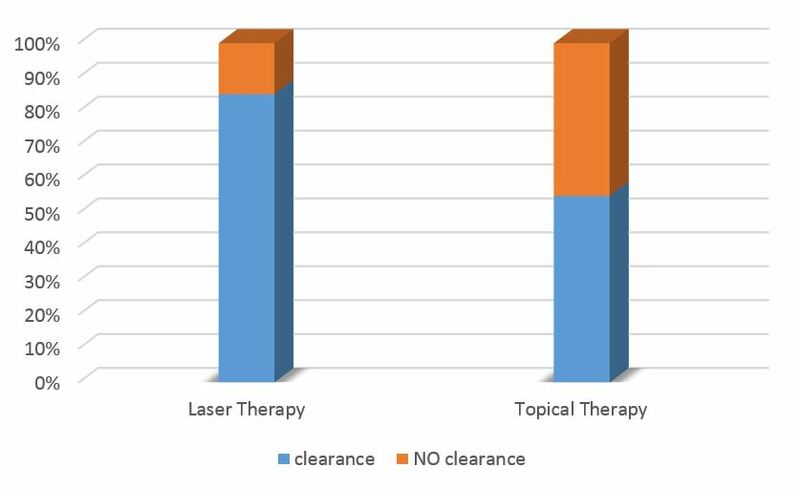 Results: The real efficacy of the treatment has been evaluated, with a recovery rate of 85% after laser based treatment compared to just 55% when topical drugs are used. Conclusion: The evidence shows that during this randomized study a significant advantage is achieved when using a laser based therapy rather than a topical treatment. Nail fungus, also known as onychomycosis or tinea unguium is an infection of the toe- or fingernail through dermatophyte. Nail fungus is typically yeast or mould based . 90 % of the cases of onychomycosis are through dermatophyte of the species Trichophyton rubrum or T. mentagrophytes [4, 9]. There are many factors that can increase the likelihood of a nail fungal infection, these include warm and moist area, trauma, tinea pedis, diabetes mellitus, heredity, age of the patient and immune system weaknesses, this is not an exclusive list. Throughout the world, many people suffer from the effects of nail fungus. Though it is not life threatening, the infected nail may be painful or can lead to other problems. The main issue is the appearance on the nail, this may lead to a psychological effect, which can in turn affect the persons’ social and working life. The typical treatment for nail fungus is through the use of antibiotics, however, due to the success rate and the side effects that these can incur, alternative treatment methods are being readily sought [5, 6, 7, 13]. An alternative therapy for the treatment of nail fungus is through the use of an antifungal nail polish, the main issues here are the following: Firstly, the time that it takes to have any effect at all and, secondly, in cases where there is more than one infected nail or if there is damage to the nail bed the treatment may not be effective [8, 14, 15]. The treatment of onychomycosis with the use of a laser is another alternative; here, the infected nail is irradiated with a pulsed infrared laser. The effect of the laser light is to destroy the fungus structure, this also has the additional benefit of not damaging the nail [10, 11]. The in vitro study has shown that at temperatures of 50°C, this therapy acts as a fungicide for both T. rubrum and Epidermophyton floccosum after 10-15 minutes. Results: An improvement of 33 %. In the study of Hochmann et al. 10, a laser diode operating at the wavelength of 1064nm and pulse duration of 0.65 ms was used to investigate the treatment of onychomycosis. The observed timeframe for the laser treatment was 4 – 6 months. 7 out of 8 patients involved had shown a decrease of their fungal infection after 2 – 3 treatment sessions. Fig. 1: Results after two laser sessions with 7 days in-between sessions. Left shows before laser therapy has started. Centre shows checkup after 5 months. Right shows the checkup after 8 months. Mycological studies were also undertaken to confirm these results. To date, there have been no studies found that investigate the recurrence rate of nail fungal infection. Despite a warming sensation during the laser treatment there have been no other side effects reported. The use of lasers is not to be taken lightly and the device should only be operated by a person that has undergone the correct training as there are risks of using lasers on human tissue. These risks include the blistering, color alternation and scaring of the tissue, should any of these occur, the treatment be stopped and further advice sought. Study group: This group consisted of 20 patients that were treated using laser therapy, specifically the FOX 1064 nm laser diode. Control group: This group consisted of 20 patients, these patients were treated using a topical therapy, the antifungal nail polish containing Niogermox 80mg/g. Patients that have used a topical treatment in the past 4-12 weeks before the study. Clinical and mycological healing of the infected nails was taken into consideration 5 months after the beginning of the dedicated treatment. Not only the results were important, but also the safety and the tolerance of side effects would be taken into consideration. To ensure a continuity in the checkup process a standard procedure is established. 2 months after beginning the treatment the clinical indications would be reinvestigated. A sample of the infected nail was taken from the nail bed, this samples were then cultivated, examined and categorized by the laboratory at the Orthopadeic Institute Galeazzi. One gram of the nail polish contains 80mg Ciclopirox and 10mg of the additive Cetylstearyalcohol. A thin film of the nail polish containing Niogermox was applied to the surface of a clean, dry nail; in addition approx. 5mm of the surrounding skin and the area around the nail was also treated. The whole of the infected nail and the nail bed was treated with the laser energy; a wavelength of 1064nm, this energy was directed towards the nail and nail bed. The laser energy would be changed into heat energy, the controlled temperature increase at the nail bed leads to a destruction of the root of the fungus. topical treatment shows a 55 % of patients have no nail fungus. Tab. 2: showing the level of patient satisfaction. The results clearly show a significantly better rate of nail fungus treatment through the use of laser treatment. Through the use of the nail polish treatment the success was seen in 11 of the 20 patients (55 %). With the laser based treatment a success rate of 17 patients from 20 was seen, this equates to a rate of 85 %. 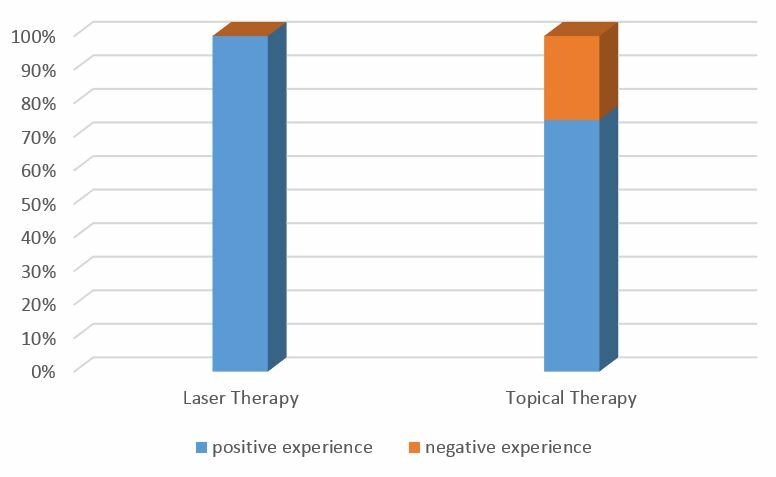 After the treatment was completed the level of patient satisfaction was also measured, the results in the graph below clearly show, that patients are completely satisfied with the laser treatment. Using the laser based treatment it was found that all 20 patients were satisfied with the treatment, this is contrast to the control group were a satisfaction rate of 75% was observed. The drop in satisfaction can be attributed to the need to apply the nail polish treatment daily. Onychomycosis is a developed disease of the nail and can lead to discomfort and pain for the patient. Also important is the aesthetic aspect which plays an equally important roll. Due to the aesthetic aspect, patients are typically more reserved in their social life and this may limit what they do in comparison to what they have done in the past. The reason for this study was to find other methods, due to the low and slow improvement rate associated with standard treatments. This study has shown that using the alternative laser therapy for the treatment of onychomycosis is an effective treatment, as not only the healing rate has improved, but this is also from a patient perspective a more convenient treatment. Out of the patients that were treated with the laser therapy, 85% show no sign of onychomycosis after the end of the treatment; in comparison to only 55% that used the topical solution which was applied to the nail daily. The treatment time scale has also shown a reduction, as the treatment was effective after only 3 months in comparison to the typical 6-10 months when using topical solutions. From the perspective of the patient, the laser therapy was well received, due to the low required involvement of the patient. This contrasts with the topical treatment that requires a daily application, if the patient does not apply it daily it will lead to an extended treatment time. 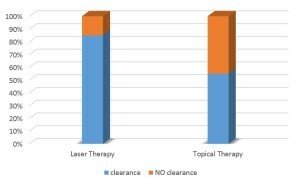 The laser therapy is seemingly associated with higher costs for the patients, however, there are clear arguments to justify the cost of the treatment as the therapy has shown to be more effective and the success rate is significantly higher. The positive aspect of the topical and systemic treatment is the relatively low price of drugs, but these add up by the length treatment period at lower success rates. In the end the costs for the treatment, whether laser therapy or topical/systemic treatment, are approximately equal. 1. Crawford F; Hollis S (2007): Topical treatments for fungal infections of the skin and nails of the foot. In: The Cochrane database of systematic reviews. 2. de Berker D (2009): Fungal Nail Disease. In: The New England Journal of Medicine (360): 2108–2116. 3. Weiss D: 3 Month Clinical Results using Sub-millisecond 1064 nm Nd:YAG Laser for the Treatment of Onychomycosis. Foot and Ankle Center, Hammonton, NJ. 4. Fleckman P, Omura EF (2001): Histopathology of the nail. In: Adv Dermatol 17: 385–406. 5. Rodríguez G, Castellsague D, Pérez-Gutthann, Stricker (1999): A cohort study on the risk of acute liver injury among users of ketoconazole and other antifungal drugs. In: British Journal of Clinical Pharmacology 48: 847–852. 6. Grover C; Khurana A (2012): An update on treatment of onychomycosis. In: Mycoses 55: 541–551. 7. Gupta AK, Uro M, Cooper EA (2010): Onychomycosis therapy: past, present, future. In: Journal of Drugs in Dermatology : JDD (9): 1109–1113. 8. Gupta, Aditya K.; Paquet, Maryse; Simpson, Fiona C. (2013): Therapies for the treatment of onychomycosis. In: Clinics in dermatology 31: 544–554. 9. Hay RJ. ; Baran R (2011): Onychomycosis: a proposed revision of the clinical classification. In: Journal of the American Academy of Dermatology 65: 1219–1227. 10. Hochman LG (2011): Laser treatment of onychomycosis using a novel 0.65-millisecond pulsed Nd:YAG 1064-nm laser. In: Journal of cosmetic and laser therapy: official publication of the European Society for Laser Dermatology 13: 2–5. 11. Kozarev J, Vižintin Z (2010): Novel Laser Therapy In Treatment Of Onychomycosis. In: Journal of the Laser and Health Academy (1). 12. Kashyap B, Bhalla P, Kaur R (2008): Onychomycosis - epidemiology, diagnosis and management. In: Indian J Med Microbiol 26: 108. 13. Marseglia A (2008): Le infezioni fungine del piede. Diagnosi e trattamento. Padova: Piccin. 14. Piraccini, BM, Sisti A, Tosti A (2010): Long-term follow-up of toenail onychomycosis caused by dermatophytes after successful treatment with systemic antifungal agents. In: Journal of the American Academy of Dermatology 62: 411–414. 15. Rotta I, Sanchez A, Gonçalves PR, Otuki MF, Correr CJ (2012): Efficacy and safety of topical antifungals in the treatment of dermatomycosis: a systematic review. In: The British journal of dermatology 166: 927–933. 16. Thomas J, Jacobson GA, Narkowicz CK, Peterson GM, Burnet H, Sharpe C (2010): Toenail onychomycosis: an important global disease burden. In: Journal of clinical pharmacy and therapeutics 35: 497–519. 17. Zook EG (2003): Anatomy and physiology of the perionychium. In: Clin Anat 16: 1–8.